Calcium carbonate was synthesized by in situ deposition technique and its nano size (35–60 nm) was confirmed by transmission electron microscopy (TEM). Composites of the filler CaCO3 (micro and nano) and the matrix poly(vinyl chloride) (PVC) were prepared with different filler loadings (0–5 wt%) by melt intercalation. Brabender torque rheometer equipped with an internal mixer has been used for preparation of formulations for composites. 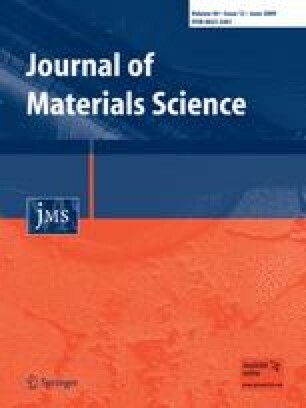 The effect of filler content both nano- and micro level on the nanostructure and properties is reported here. The nanostructures were studied by wide angle X-ray diffraction and scanning electron microscopy. The mechanical, thermal, and dynamic mechanical properties of PVC/micro- and nano-CaCO3 composites were characterized using universal testing machine, thermogravimetric analyzer, and dynamic mechanical analyzer. The results of thermal analysis indicated that the thermal stability of PVC/nano-CaCO3 composites was improved as compared with corresponding microcomposites, and that of pristine PVC and maximum improvement was obtained at 1 and 3 phr loadings. However, the tensile strength decreased significantly with increase loading of both nano- and micro-CaCO3, whereas storage modulus and glass transition temperature increased significantly. Authors thank the University Grants Commissions, New Delhi, for providing financial assistance under grants of Special Assistance Programme (SAP) at Departmental Research Support (DRS) Level.